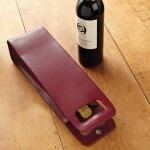 One Bottle Red Leather Wine Tote (P/N PA8340). This one-piece bag features a smooth leather exterior and 100% cotton interior; handle cutouts with a magnetic snap keep the bag closed. Sleek and stylish, our 1-Bottle leather wine tote is perfect for transporting a bottle of wine to a special gathering—or for use as a gift bag that's a gift in itself.